Once again I’m photographing the ‘ordinary’ trying to make it appear ‘extraordinary’. I spent virtually all day locked in front of my computer surrounded by financials, tax forms and other detritus of the accounting world. Mind numbing for sure. When I was ready to shut down for the night, it occurred to me that I hadn’t photographed anything that day. I must admit that it is hard to switch over to ‘right brain’ thinking after spending all day in the ‘left brain’, but I forced myself to look at my environment with a creative eye. I spotted a few blank CDs on my desk, and decided to arrange them under my desk lamp so that their shiny sides reflected the light like a prism. 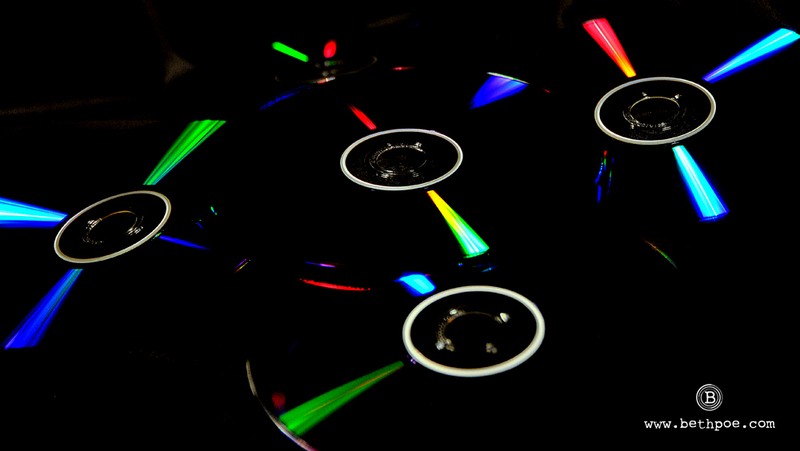 I arranged the CDs on a black blanket, and then underexposed the shot to highlight the rainbow of psychedelic colors. Groovy man….